Parker Place has a comfortable homely feel and with 4 bedrooms is ideal for up to 2 or 3 families or a smaller party if your prefer to have your "own space" to relax in. It is also popular with the fishing groups who like to return to a comfortable well equipped house after a hard days fishing, filleting their catch at the fish cleaning facility then retiring to the entertainment area to brag about the days catch. It sleeps up to 12 people in 9 beds. The living area is spacious with Satellite TV, DVD and CD player. The kitchen is fully equipped with gas stove, microwave, 2 large fridges and a freezer and full range of cooking and eating utensils. A large separate pantry for storing your food and supplies. There is a BBQ on the large covered deck with outdoor furniture, bar, drink fridge and day beds. An ideal entertainment area for family and friends. There is a viewing deck with views to the ocean. A 2 vehicle carport provides protection for your cars & allows convenient unloading/loading should it rain. Laundry is adjacent to carport and has auto washing machine, freezer, shower, and storage for your gear. Bedrooms: No.1 has queen bed, with private patio. No.2 has queen bed. No.3 has a queen bed and set of bunks. No.4 has 2 sets of bunk beds. Bathrooms: Bathroom with toilet and separate toilet and 2nd shower in laundry area. Power is supplied by state of art solar system with generator backup. Guests are requested not to bring any appliances with heating elements such as hair dryers. Property is located in the quiet 2nd Valley and easy walking distance to Happy Valley Wilderness Retreat with shop, bistro, bar and fuel. 200 metres to Ocean Beach. Please note that Fraser Island is a remote location and there is no labour available for cleaning so we can only operate on a "self-clean basis". You are required to leave the property in the same condition as you found it. Unfortunately there is no commercial laundry on Fraser Island, so you must bring your own linen: top & bottom sheets, pillow case & towel (No Sleeping Bags allowed). Linen can be hired from the local Fraser Island Retreat but must be arranged in advance. We supply pillows, blankets & tea towels. We require a security deposit which may be used to cover any additional cleaning costs or costs associated with non compliance with our linen requirements. We have local Managers who live in Happy Valley and can assist you if you have any issues. Unfortunately Homeaway does not allow us to list our website or contact details on this page. 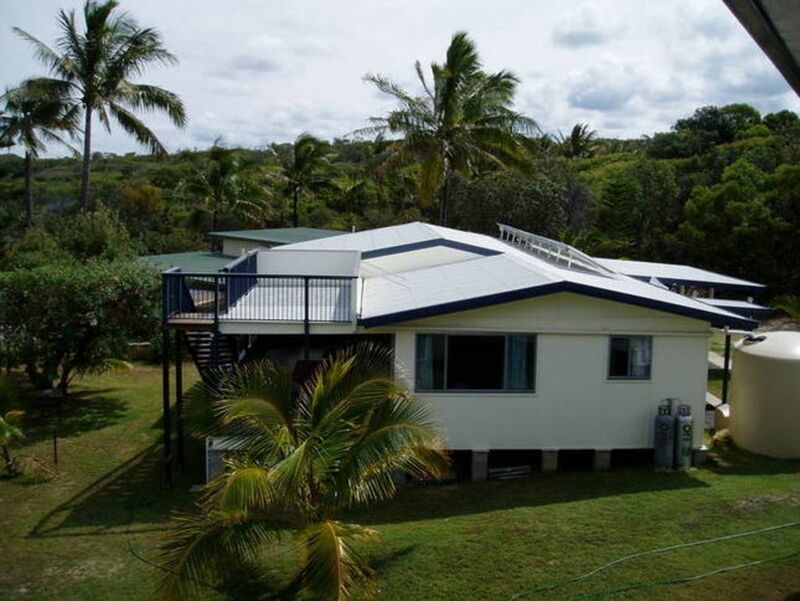 Please simply google Annabell's Fraser Island Accommodation for our website which has our contact details and also an information pack on our houses in Happy Valley. Anne Bell and her husband Scott have had a long association with Fraser Island having honeymooned there and then camped with family for many years before buying the property. The house was always known as "Parkers Place" after the previous owner so we decided to keep the tradition going. The house was extended in 2006. Anne has 4 houses that she manages under the "Annabell's Fraser Island Accommodation" banner in Happy Valley. Very well maintained and a real pleasure to stay there. There were 11 of us who stayed there and we all found it very comfortable and clean. It was the first time for my 90 year old mum and her elderly sister to visit Fraser Island, so they had a ball. Only thing we didn’t know was we couldn’t use our slow cookers but we managed everything very well. Would recommend anyone who wanted to have a getaway to use this property. Definitely will be back one day. Hi Lawrie, pleased to hear you enjoyed your stay and thank you for leaving the house in very good condition. Love to have you back again. Perfect location for our group of 11! We loved the house plenty of space for us all! Very clean and we stocked! Very spacious for adults and kids! Bed were very comfortable! Happy Valley pub was a nice spot for dinner and we'll stocked shop! Clean, well stocked, great size for group of 12, close to beach, shop and pub. Excellent staff at the resort whrre you check in. Only thing is i would have loved a second standing fan for the other bunked room as the nights can be hot. There is even an outdoor sink for fish cleaning. Will be staying again. Wonderful house to stay at, excellent location. Enough room for us all & had everything we needed. Parker Place was exactly what we were looking for... The rooms were spacious with heaps of room, the outside bbq area was perfect and the upstairs lookout was an escape within itself... We had an amazing stay here and would recommend Parker Place to anyone who wants a get away close to everything.